Unlike most games about Armageddon, which strive for realism by skimping on vehicles and bullets, Nuclear Outrun is over equipping players for the end of the world. Players will find a large arsenal of weapons like the Shark Gun, Twitgun, and even a good ol’ fashioned flamethrower. Unlike most doomsdays, players will find a grand variety of survivors, who are each escape artists in their own right (hipsters can indeed be of help when running away from zombies), as well as more wacky vehicles than any garage can fit. 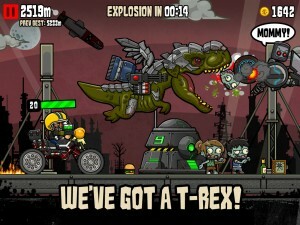 The game is also announcing that Weapon of Mass Destruction do indeed exist…in the form of George the cyborg T-Rex. Annihilate zombies with 25 hilarious weapons, such as the nefarious Squid Launcher, the room-clearing Fart Bazooka, and the bloodthirsty Shark Gun. Unleash devastating Weapons of Mass Destruction such as George the laser-shooting T-Rex and the Teddy Bear Bomber. Activate Power-Ups including the terrifying Chicken Rain and the Coins Unicorn.